A 1,095 ft sq house is listed on MLS and is being marketed with having 7 BEDROOMS – 4 on the main floor and 3 are in the basement. If a bedroom below grade does not comply with current fire and building codes, then this must be noted in the REALTOR Remarks and in the Public Remarks. You will note the realtor does state in the description (the windows of the 3 rooms in the basement may not be egress but it should be very possible to make them egress). 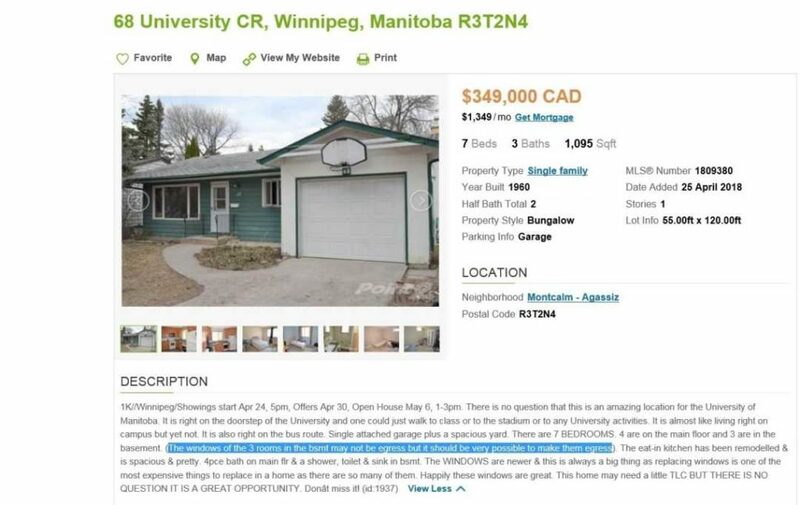 Technically, the realtor is complying with the WinnipegREALTORS disclosure policy by stating the rooms in the basement do not comply with current fire and building codes. I find this manner of marketing concerning and am in discussions with the Province and the Canadian Real Estate Association’s REALTOR Code of Ethics as to the technicalities of marketing a house in this manner. I am also working closely with the City of Winnipeg By-Law enforcement department to monitor this house once sold.